MINNEAPOLIS, MN--(Marketwire - March 10, 2011) - Despatch Industries, a leading technology and equipment provider for the solar industry, secured orders and letters of intent for more than fifty firing furnaces at last month's SNEC PV Power Exhibition in Shanghai, China. 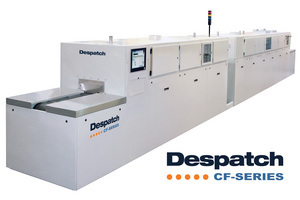 The orders were for Despatch's best-selling CF Series firing furnace. Despatch Industries continues to be the first choice firing furnace provider for the world's top solar cell and paste manufacturers. "The SNEC Exhibition was the ideal venue to meet with our customers and to celebrate growth in China's solar cell manufacturing market and the continued success of both our customers and Despatch Industries," states Adam Ge, Managing Director, Despatch China. "2011 is off to a great start and we expect this strong momentum to continue." Despatch Industries is the global leader in producing innovative, next generation tools and technology for the solar cell manufacturing industry. The company's regional offices and complete global service network allow Despatch to provide local sales and product support to all customers worldwide. Despatch equipment is consistently recognized for exceptional performance and process quality, optimal cell efficiency, maximum uptime and reduced operating costs.